For this post in our indie picture book creation process series, we're going to dive deep into the research process. 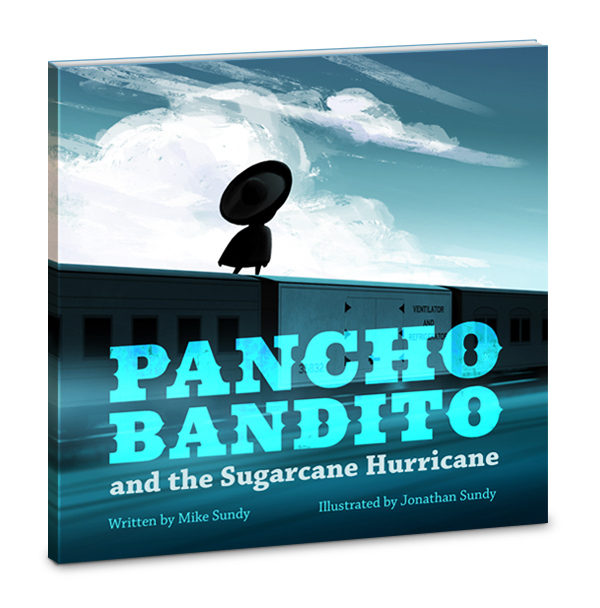 We'll use our latest picture book, Pancho Bandito and the Sugarcane Hurricane (aka Pancho 3), as an example. Research through books and the web is vital. But another wonderful way we get inspired is to do physical research. There's nothing like putting ourselves in the shoes of our characters and using our five senses to experience the story and world as they would. For Pancho 3, we knew we wanted to set it on a train. Fortunately, we had a wonderful resource an hour's drive away. I visited the #1 tourist attraction in Sacramento: the California State Railroad Museum. I went on a research trip here and shared the photos with Jonathan. Jonathan absorbed the reference photos and did his own research online as well. 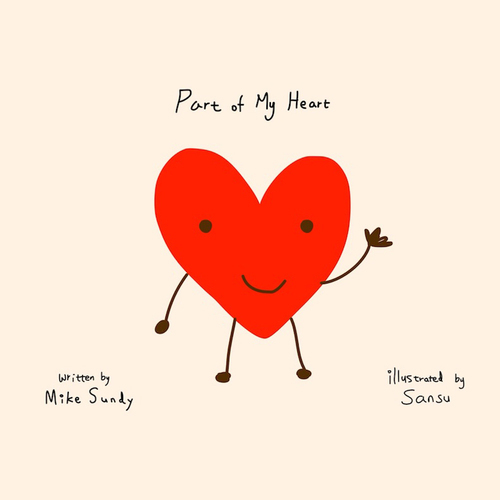 He created the beautiful art in the book and I used the research to help inspire the story direction. Writing research is a tricky thing and I have to fight to maintain a balance between research and actually writing. I'm (hopefully) writing a book on a topic I'm interested in, so it's easy to get caught up in the minutiae of research. Then several months go by and I haven't actually written anything, because I've been deluding myself that my procrastination was research. I think it's also a mistake to try to do all of research up front. I want enough research to feel on solid ground when starting to write, but not so much that I'm paralyzed by a devotion to authenticity. I try to do 80% of my research up front and then fill in the rest as I'm writing. If I get stuck on a story point, briefly diving back into research can help inspire a solution or way to pivot. 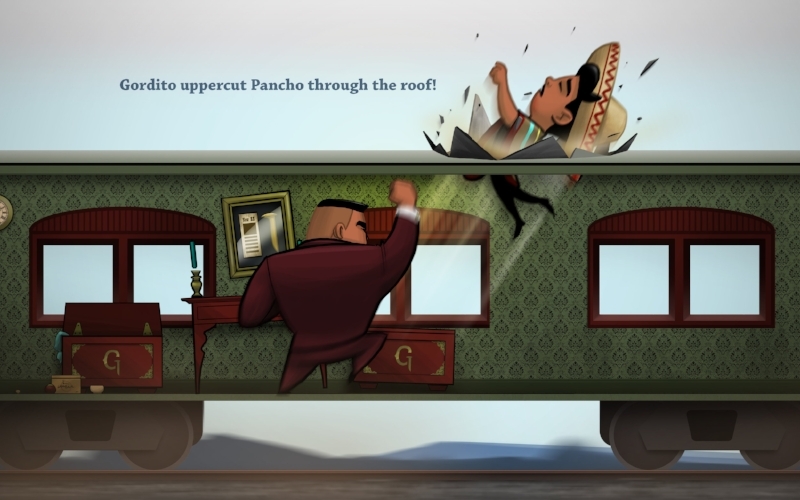 For example, I had started writing Pancho 3 but it was mainly a succession of Pancho fighting desperadoes in different train cars and it all felt like too much of the same thing. Jonathan pushed me to find more of a puzzle-type of obstacle like we had with the trials in Pancho Bandito and the Avocado Desperadoes. 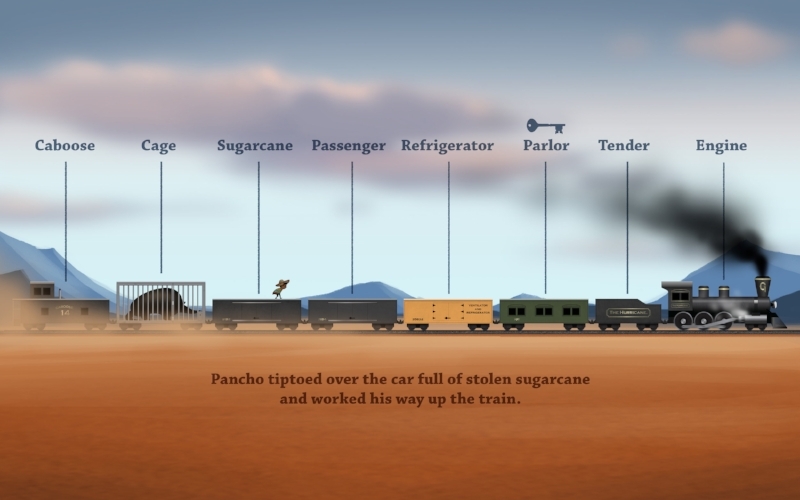 Doing the research led us to the idea of Pancho being trapped in a refrigerator car, which ended up being a key story obstacle. The research also helped with the mechanics of the refrigerator car's doors and how they would swing. Refrigerator (reefer) car from California Train Museum. Note how the doors swing and their color. Bright colors like yellow or orange were used for refrigerator cars because their contents had to be tended to in the rail yard first. Aside from a few design details (triangular hinges), our refrigerator car is pretty close to the reference. Research pic inside the refrigerator car. Note the stacked fruit crates. Jonathan put our family name on the fruit crates: Sundy. One of the great benefits of research is inspiration. When I start a story, I have some story kernel in my head but many details are unclear. Research can help me decide on some load-bearing walls for the story and make it more concrete. It helps me picture the story in my head and provides a mental model to strive to make real. For example, the train itself is kind of a character in this book since it's the moving residence of the main villain. Research gave us details to help flesh him out. You learn a lot about Gordito by the opulence of his parlor car and the way he decorates his train with trophies and newspaper clippings of his business success. Actual fancy parlor car interior. Sometimes research can inspire the landscape. 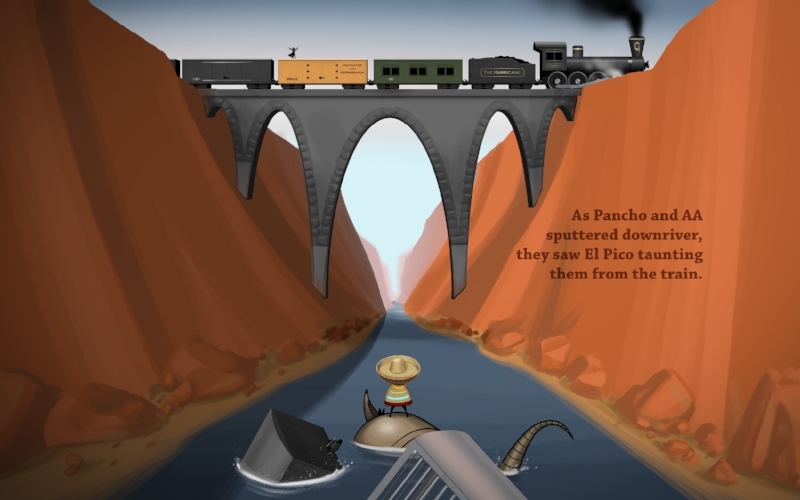 In Pancho 3, the train became the literal map for the story and route that our hero took as he sought his objective. He had to travel from the back of the train to the front, which meant we needed to set different turning points in the story in (or on top of) certain train cars. A lot of work and rearranging went in to the order of the train cars. The train gets split twice, so we needed certain cars in a certain order for the story to work. One of the first tasks we had to sort out before writing the story was to figure out the layout of the entire train. 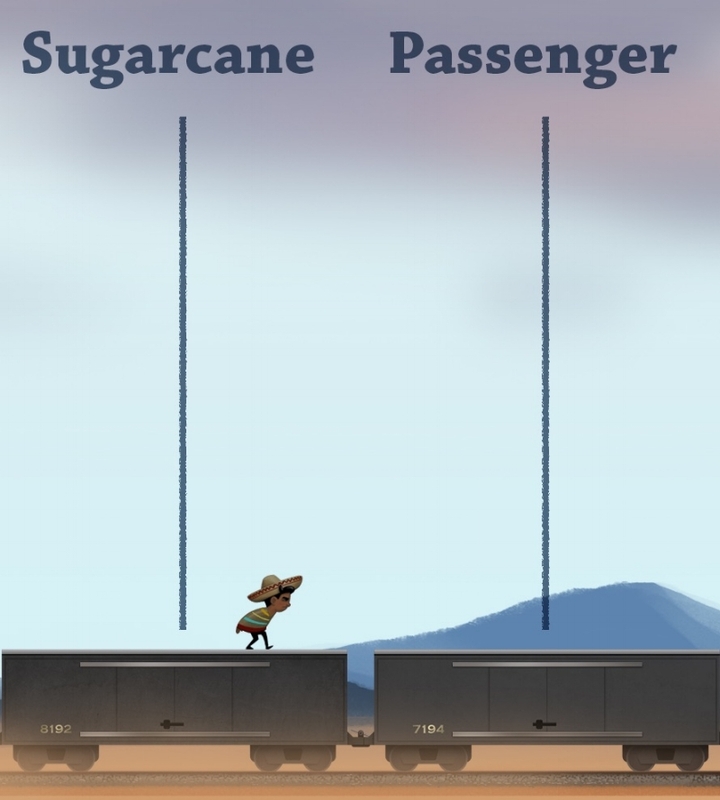 Early mockup to help us figure out order of train cars and scale of the characters in relation to the train. In our other Pancho books, we always have a page with a map. In this book, the train was the map! For example, one thing we learned was that trains of that era had titles with periods. So we did that for our train, The Hurricane. It may seem like such a small thing, but it helps the story to feel real. We also added details like the green color and arched windows on the parlor car. Note the period on the train name. Note the arched windows and unique green color on this lovely parlor car. We also included details like a period on our train name and the arched windows and green color of the parlor car. We put in other miscellaneous details that drew from real life train cars at the museum. For example, the look and shape of the engine. This engine is gorgeous in person. A smaller engine but it still gave us a good sense of some details. Wide shot that includes our engine. Closer shot that gives more detail on the smokestack and top of engine. Research provides an excellent opportunity to develop and illustrate character. The palette of a certain time period and setting gives many options to choose from when differentiating characters. One key symbol we discovered during our research was the golden spike. This is based on an actual railroad spike driven to connect the two halves of the Transcontinental Railroad. We partially based Gordito on Leland Stanford, the railroad baron who helped complete the Transcontinental Railroad. We liked the spike so much as a symbol of locomotive wealth that we incorporated it into Gordito's brand. You can see that it's part of the "G" symbol he uses. I believe this is a replica cast from the original mold of the Golden Spike. #30 is the dapper railroad tycoon (and some say robber baron) Leland Stanford who helped create the Transcontinental Railroad. The askew glass case on the wall contains Gordito's golden spike. Close up of the spike in Gordito's "G" brand. Can you find the other golden spikes hidden in the book? Sometimes we need to deviate from research. If we have a key story point that needs to happen a certain way for emotional purposes, we will go a different direction than the actual research. The spell of the story is the important thing, so we have to make sure our deviation preserves that spell. For example, we ran into a problem with the rail couplers (hitches) of the period. Most seemed to be the link-and-pin model show below. We had to deviate from research here for story purposes to make sure it was the kind of coupler that could be separated by an object falling from above, like El Pico, Gordito's dastardly lieutenant. It was a key part of the story (and emotionally satisfying) that Pancho pulled off an impossible shot to drop El Pico on the coupler and separate the cars. Link-and-pin coupler that was accurate to the period. This coupler was not accurate (at least not common) to the period, but necessary for story purposes. We also painted it yellow so it would stand out more, which is rare but occasionally done. 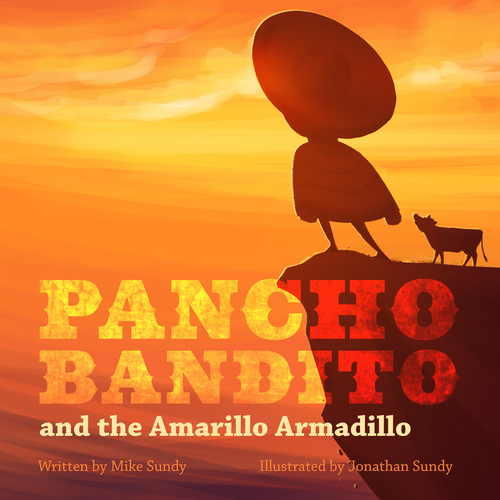 We have a lot of Easter eggs in our Pancho books, because kids love finding them and we get a chuckle out of putting them in. Research provides opportunity to layer these Easter eggs in. For example, the numbers on the parlor car and refrigerator car are the same as the ones in the California State Railroad Museum. Jonathan threw in some other Easter egg numbers - one of the cars has his scrambled birth year and one has mine. Another Easter egg is the newspaper in the background of Gordito's caboose: The Silver City Sentinel. Close up shot of the Hurricane that shows Jonathan's scrambled birth year (1982) and mine (1974.) Yes, I'm older. No need to bring it up. The newspaper in the background of the caboose is The Silver City Sentinel, which is the paper from the town Pancho grew up in. Could this be a hint that Pancho might actually know this mysterious Gordito? In summary, research is vital and helps us create an authentic story world. As long as we avoid the pitfalls of procrastination and aren't too rigid to authenticity, it can be a strong tool to map our story, round out characters, and put in entertaining touches like Easter eggs. 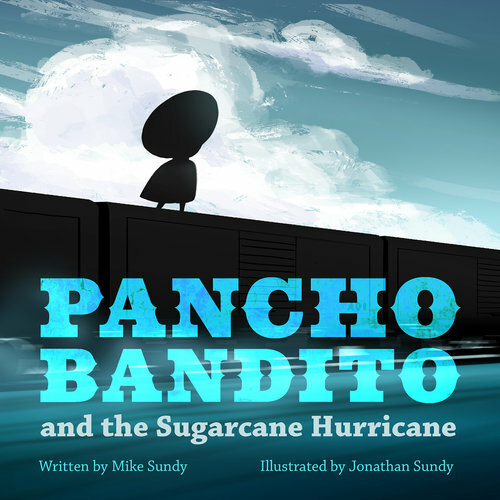 To enjoy the fruits of our research and find all of the Easter eggs, click the picture below to get Pancho Bandito and the Sugarcane Hurricane!